NOTE: We’re now offering DHTMLX Scheduler .NET, a web control optimized for ASP.NET MVC. 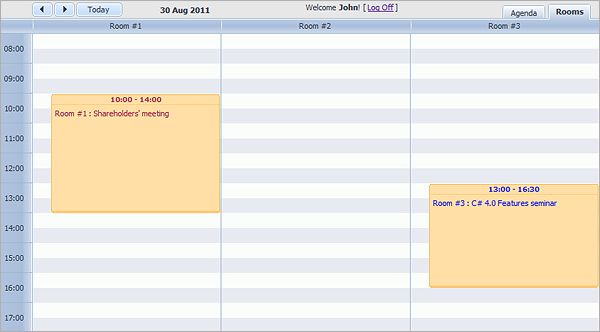 You can also find the latest version of Booking Calendar in MVC3 here. In the previous MVC-related tutorial we described how to integrate dhtmlxScheduler into an ASP.NET MVC application. After publication, we received plenty of feedback, reflecting that the tutorial was helpful to many of ASP.NET MVC developers. Therefore we decided to continue this series and show you how to extend the calendar functionality to implement a room booking system. In this tutorial we’ll go further and add multi-user functionality to the scheduling system, allowing different users to make changes in the calendar simultaneously without impacting each other. 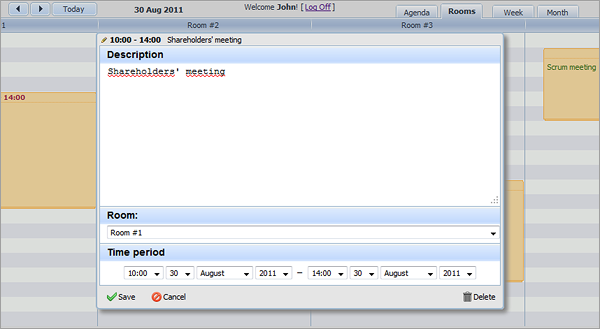 As we already said, we’ll create a meeting room booking system which will look like on the screenshot below. 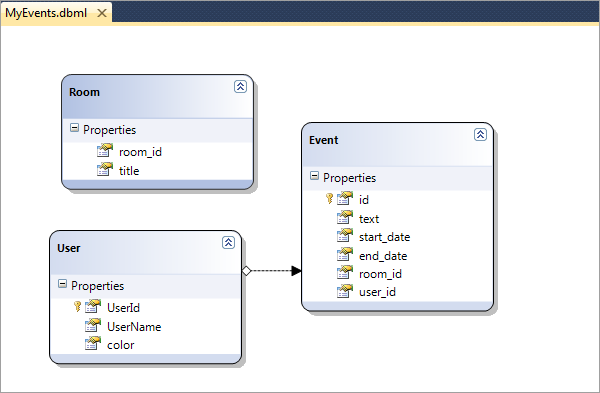 In the end of the tutorial we should get a ready-to-use event scheduling application that allows end-users to add, delete, edit, and move events between rooms. Since we’re going to continue our previous tutorial, it’s assumed that you have already learned how to integrate the calendar into an ASP.NET MVC application. 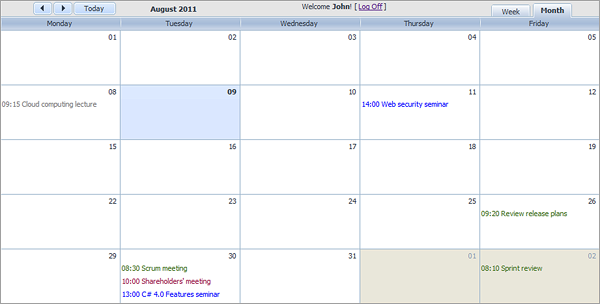 If not, please read it first: “Event Calendar for ASP.NET MVC with dhtmlxScheduler”. The list is not short, and you would spend a lot of time trying to implement such an application from scratch. Fortunately, most of the requirements can be achieved by using dhtmlxScheduler extensions and standard ASP.NET MVC solutions. So I believe we’ll manage to complete this task within half an hour. In the previous tutorial we used dhtmlxScheduler 2.6, but recently the new version 3.0 has been released. The update includes lots of small bug-fixes and offers a number of new useful features that we might need. So at first you need to update the dhtmlxScheduler package (available under GNU GPL). You can grab the most recent version from the Downloads page. After you download the package, copy the content from the folder ‘codebase’ to the folder ‘Scripts’ of your project, like we made before with the files of dhtmlxScheduler 2.x (new files will overwrite the old ones). In order not to create user infrastructure manually, we will use the build-in ASP.NET Membership utility (read more about it here). All these tables are used by the ASP.NET Membership for providing its functionality. We should edit only the table aspnet_Users by adding a column ‘color’ into it. 2. Customize authorization-related controllers and views. When you finish with this (created all the needed tables and added the missing columns), don’t forget to refresh MyEvents.dbml. NOTE: If you don’t want to edit DB manually you can use db from the package with the sample files. It contains all needed tables and columns. Here ‘MyCalendarConnectionString’ is the name of the ‘connectionString’ attribute set in the same file. Generated views and controllers don’t need any corrections. 2. It’s not necessary that our app will have free registration, so we can remove the registration link from LogOn.aspx and related ‘action’ from the controller. After all these steps we’ll get a working calendar system which contains a user login form. Server-side checks are needed to provide security of the application. Client-side checks do not affect the application security and we could do without them, but it would make our system slow. So, we will define client-side checks to provide better performance and real-time user experience. We will add the same rules to the server-side. If a user is not authorized to edit the events, or a user name doesn’t match the name of the current user, then changes won’t be saved and ‘error’ will be returned. We have a few last things left at this step. We need to include the information about the event holder to our data feed and pass the needed models from the Index.aspx controller to the view. Also, we will specify the property ‘color’ for events. From this moment on, events created by a each user will be colored into appropriate color. Expired events, which can’t be edited, will be showed in grey color as disabled. Here ‘CalendarModel’ is a class that contains information about the current user and available rooms (creating a list of available rooms is our next step). This is how our event calendar will look like. In Month View we can see the events displayed in different colors by a user who created them. The old events are displayed in grey color and can’t be edited. 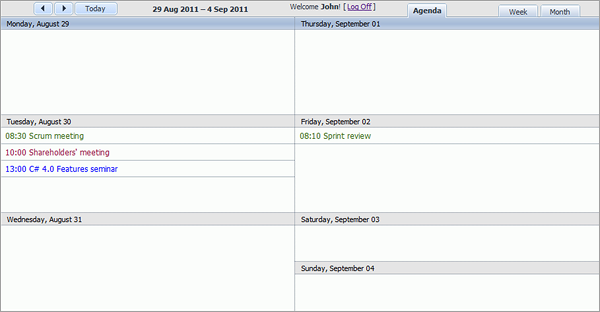 After these changes, we’ve achieved our main goal and created a multi-user calendar. All users can see all the events, but events can be edited only by a user who created them. In compliance with the requirements we’ve set in the beginning, we will add the ability to show events by room and view all events within the current week. To see the list of events taking place within the current week, we can use Week Agenda View, a new feature available in dhtmlxScheduler 3.0. All we need to do is to add the appropriate script and button to the Index.aspx file. 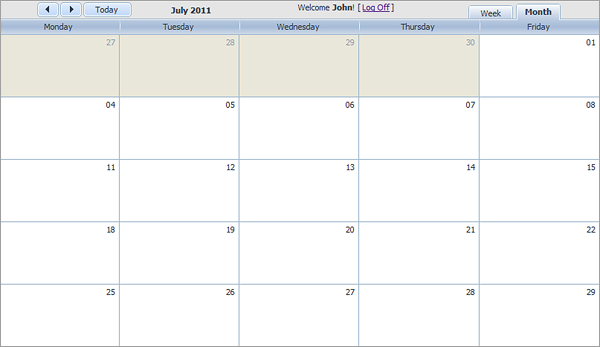 The image below shows how our booking calendar will look in Week Agenda View. We can see the list of events assigned per each day of the week. If you have followed these 6 steps of our tutorial, you now have a multi-user calendar that allows end-users to easily book meeting rooms and arrange the events between rooms. The final package with all files and assets may be downloaded here. It seems to me that you skip over the infrastructure a bit. However Windows.NET2.0.50727_regsql.exe doesn’t seem to be readily available. Google’s only link is to this page. This page gives some hints, but after running aspnet_regsql.exe from the .NET 4 framework a get quite a bit more in my database, than the user table in your example. Furthermore the table aspnet_Users (not just User, as in your final code) has quite a few columns. Can you maybe update with a step by step guide to make the infrastructure and a link to the needed tools? Jens, we’ve updated step 2, so hopefully this part will be more clear now. this is a really good documentation here, very very helpful. Do you mean some kind of live update ? Do you mean separate tabs for each room? It possible to use filtering api of scheduler and hide show events related to the different rooms based on some select-like control on the page. I downloaded tis project working fine but need to fetch active directory users no need of asp.net membership tool how to fetch and how to validate those users and implement logic into this project can any one help me. Also it looks like the example that you are using is using Webform Views. Could you use the new Razor engine that comes with MVC3? +1 for Razor. Please do at your earliest. If you have any correction to locale files – we will be glad to accept it. Your tutorial really useful and trying to achieve auto update, but not able to complete. Could you tell me how to enable auto update using the setAutoUpdate method. Stay tuned, we are working on separate article about scheduler in live-update mode. Great post out there. Helpful information. Booking calendar really helps me and it really suits my needs. Hi, Thanks for the nice article. I downloaded this code and tried to run it. But I never manage to get the Event list after logging off the application. I logged in the application, created event and saved it. I was able to see the event appearing in all the different views like Month, week, room and agenda. But as soon as I logged off the event got disappeared. But it did not solve my problem.. I tried in all browsers Mozila, chrome, IE8, IE9 but as soon as I logged off, event got disappeared. When I checked in the Event table in the database, the entries were not there for the events that I created. I debug the application and I came to know that when click on Save button in the Lightbox, the start_date and end_date value that we try to retreive in MyEvent.designer.cs are null, whereas all other fields from lightbox like text, roomid, userid has their respective values. SO I am not sure why start_date and end_date value are not being passed in the MyEvent.designer.cs. Due to this, the changedEvent’s start_date and end_date remains as null and “inserted” action result is not getting executed inthe Save View. So the events entry never getting saved in the database. Please help me in to resolve the issue. Our support team will look into this issue. I run this command aspnet_regsql.exe -E -S -d -A m but the tables are not added in the database. Will they be added automatically? please specify the step by step procedure . It is urgent. Tool should create needed tables automatically if you specified correct server and database names. it does display that membership feature is added and finish successfully but when i check the database in visual studio, it only has the events table ant not the tables you mentioned above. i downloaded the package and logged on using “user” as username and password. when i created the event , it is not saved in the database. Unfortunately, there is no a simple way to do it. You may check the sources of Unit View extension, and maybe try to modify the code for your needs, but this would be a complex customization. Hello..nice project but the events did’nt save after refresh or log off. please help and fix.. thank you..